All things to do in Oamaru: by yourself or following tours. If you prefer to let others do their job while you sit back and relax, then taking a tour is a good option to see both the town and the surrounding region. The other advantage of taking a tour instead of trying to find out everything yourself is that the tour guide usually has vast knowledge about the area and its attractions. You can get all the information that you need directly from your tour guide. If you are into wildlife there are specific tours that cater for this. 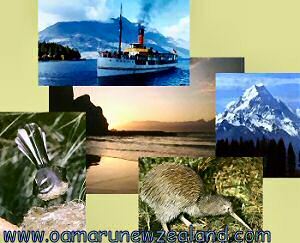 This includes tours to see marine life, birds and the very special glowworms. If you are into history and culture, then there are historical tours to learn about the Maori heritage and the country’s fascinating history. For food and wine lovers, add in gourmet tours in your New Zealand vacation that will let you immerse yourself in the country’s delightful food and cuisine. 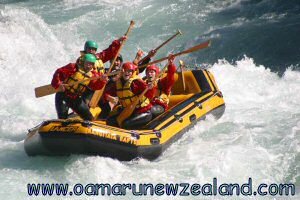 And last but not least the New Zealand adventure tours for outdoor junkies. There are a range of New Zealand cycling tours, walking tours and kayaking tours to choose from that will enable you to enjoy the great outdoors of New Zealand. Oamaru is well known for the conservation of the blue eye penguins whose colony lies close to the town’s historical Victorian precinct and harbor. The town’s original architecture still remains and has been restored over the years. The old buildings built from local limestone form part of New Zealand’s protected heritage. The Victorian harbor that lies close to the town centre houses traditional craftsman that still practices the skills of their forefathers. 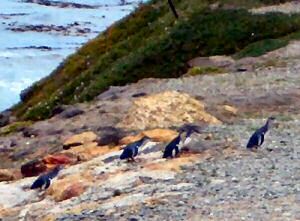 The Oamaru Blue Penguin Colony is a natural nesting area for the blue penguins that return every day after feeding out at sea. A 30 minute walk to Bushy Beach where you will be able to see the rare Yellow-eyed penguins returning to shore every evening. A must do to include in your New Zealand holidays. This is truly a unique wildlife experience not to be missed. There is a grandstand where you seat and watch as the penguins ride in on the waves and amble up to their nests in the Cliffside. In the day time, you can take a tour to see a penguin nest box and if you are lucky, there may be a penguin nesting inside. At the colony centre, there is an informative and educational visitor centre for visitors. Gifts and souvenirs are available as well. The entry fee ranges from NZD15 to NZD22.50 per person. No photography is permitted to not damage the eyes of the blue penguins. This tour will take you back to early New Zealand where you can view the grand homesteads and old estates that stand testimonial to the rich history of the country. Visit the famous Totara Estate where frozen meat industry of New Zealand first originated. At the nearby Eldersile Estate, you will be able to view the historic gardens that were designed by Sir Joseph Paxton. Included in this tour is also a visit to Parkside where you will be taken a tour of the home of Oamaru Stone. This famous limestone is the purest in the world. 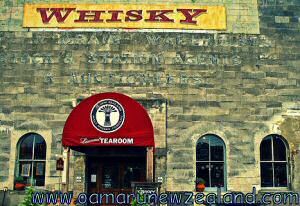 The New Zealand Malt Whisky Barrel house is located near the harbor near to the town centre. This guided tour will include whisky tasting as part of the experience. You will be able to sample various local fares during winter and summer and this include whisky stews, mash, shanks, gourmet food and salads and Irish coffee. Make sure to enjoy a taste of the local produce when you travel to New Zealand. tour next takes you to the coastal road to view the famous Moeraki Boulders. Enroute you will be able to enjoy the stunning view along the coast. Thereafter return to Oamaru via Graves Dam and Parkside Quarry (home of Oamaru Stone). 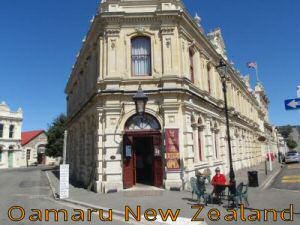 For more things to do in Oamaru without following a tour, read on at: Oamaru Attractions. When you are planning to drive through Oamaru, make sure to break your journey for 1 night and explore this little town with cute blue penguins, Victorian bed and breakfasts and award winning gourmet restaurants. These blue, little penguins – or korora as the Maori name them – are the smallest penguins in the world and can be found in many places around New Zealand and Southern Australia. However being so small and coming ashore only under the cover of darkness, you won’t see them much anywhere else on the South Island. This makes Oamaru’s Blue Penguin Colony the easiest place in New Zealand to watch a good number of these penguins, as the observation centre is located just a 5 minutes drive from the town centre. The penguin colony itself is within walking distance of the town centre. You can also admire Oamaru’s yellow-eyed penguins: one of the world’s most rare penguin species. Accommodation: when self driving around in New Zealand by car, the best value for money you can get is staying overnight in motels. We however opted to stay in a bed and breakfast in stead of one of the motels because we preferred to chat and find out from the local owners as much as possible about the easy pace of life in their city and where to go. Good idea, as they pointed us to the yellow eyed penguin colony. 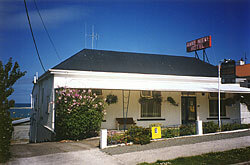 Anne Mieke’s guest house is a non smoking Bed and Breakfast a few minutes walk away from the blue penguin colony, the Historic Precinct, shopping streets, restaurants,Oamaru Information Centre and the Oamaru Gardens. 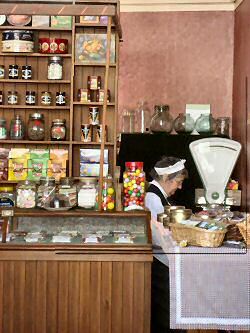 Food: The best Oamaru restaurant stands at the historical building called "Criterion Historical Bar". Food prices were moderate and the chef tries out a fine new cuisine based on local New Zealand produce. The coffee was perfect! Oamaru is a pretty historical town on the east coast of New Zealand between Dunedin and Christchurch. A great place to stop and spend the night if you are touring the east coast by car and want to experience the South island in a nutshell.